Vegetated dunes are recognized as important natural barriers that shelter inland ecosystems and coastlines suffering daily erosive impacts of the sea and extreme events, such as tsunamis. However, societal responses to erosion and shoreline retreat often result in man-made coastal defence structures that cover part of the intertidal and upper shore zones causing coastal squeeze and habitat loss, especially for upper shore biota, such as dune plants. Coseismic uplift of up to 2.0 m on the Peninsula de Arauco (South central Chile, ca. 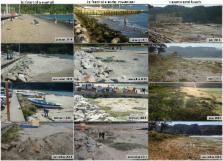 37.5º S) caused by the 2010 Maule earthquake drastically modified the coastal landscape, including major increases in the width of uplifted beaches and the immediate conversion of mid to low sandy intertidal habitat to supralittoral sandy habitat above the reach of average tides and waves. To investigate the early stage responses in species richness, cover and across-shore distribution of the hitherto absent dune plants, we surveyed two formerly intertidal armoured sites and a nearby intertidal unarmoured site on a sandy beach located on the uplifted coast of Llico (Peninsula de Arauco) over two years. Almost 2 years after the 2010 earthquake, dune plants began to recruit, then rapidly grew and produced dune hummocks in the new upper beach habitats created by uplift at the three sites. Initial vegetation responses were very similar among sites. However, over the course of the study, the emerging vegetated dunes of the armoured sites suffered a slowdown in the development of the spatial distribution process, and remained impoverished in species richness and cover compared to the unarmoured site. Our results suggest that when released from the effects of coastal squeeze, vegetated dunes can recover without restoration actions. However, subsequent human activities and management of newly created beach and dune habitats can significantly alter the trajectory of vegetated dune development. Management that integrates the effects of natural and human induced disturbances, and promotes the development of dune vegetation as natural barriers can provide societal and conservation benefits in coastal ecosystems. Generalized linear mixed models: a practical guide for ecology and evolution. How should ecologists and evolutionary biologists analyze nonnormal data that involve random effects? Nonnormal data such as counts or proportions often defy classical statistical procedures. Generalized linear mixed models (GLMMs) provide a more flexible approach for analyzing nonnormal data when random effects are present. The explosion of research on GLMMs in the last decade has generated considerable uncertainty for practitioners in ecology and evolution. Despite the availability of accurate techniques for estimating GLMM parameters in simple cases, complex GLMMs are challenging to fit and statistical inference such as hypothesis testing remains difficult. We review the use (and misuse) of GLMMs in ecology and evolution, discuss estimation and inference and summarize 'best-practice' data analysis procedures for scientists facing this challenge. Increasing destructiveness of tropical cyclones over the past 30 years. Theory and modelling predict that hurricane intensity should increase with increasing global mean temperatures, but work on the detection of trends in hurricane activity has focused mostly on their frequency and shows no trend. Here I define an index of the potential destructiveness of hurricanes based on the total dissipation of power, integrated over the lifetime of the cyclone, and show that this index has increased markedly since the mid-1970s. This trend is due to both longer storm lifetimes and greater storm intensities. I find that the record of net hurricane power dissipation is highly correlated with tropical sea surface temperature, reflecting well-documented climate signals, including multi-decadal oscillations in the North Atlantic and North Pacific, and global warming. My results suggest that future warming may lead to an upward trend in tropical cyclone destructive potential, and--taking into account an increasing coastal population--a substantial increase in hurricane-related losses in the twenty-first century. Disturbance and landscape dynamics in a changing world. Disturbance regimes are changing rapidly, and the consequences of such changes for ecosystems and linked social-ecological systems will be profound. This paper synthesizes current understanding of disturbance with an emphasis on fundamental contributions to contemporary landscape and ecosystem ecology, then identifies future research priorities. Studies of disturbance led to insights about heterogeneity, scale, and thresholds in space and time and catalyzed new paradigms in ecology. Because they create vegetation patterns, disturbances also establish spatial patterns of many ecosystem processes on the landscape. Drivers of global change will produce new spatial patterns, altered disturbance regimes, novel trajectories of change, and surprises. Future disturbances will continue to provide valuable opportunities for studying pattern-process interactions. Changing disturbance regimes will produce acute changes in ecosystems and ecosystem services over the short (years to decades) and long-term (centuries and beyond). Future research should address questions related to (1) disturbances as catalysts of rapid ecological change, (2) interactions among disturbances, (3) relationships between disturbance and society, especially the intersection of land use and disturbance, and (4) feedbacks from disturbance to other global drivers. Ecologists should make a renewed and concerted effort to understand and anticipate the causes and consequences of changing disturbance regimes. Conceived and designed the experiments: EJ. Performed the experiments: IFR EJ CV. Analyzed the data: IFR. Contributed reagents/materials/analysis tools: CV. Wrote the paper: IFR EJ DMH JED DM. This study was supported by CONICYT Chile (National Commission for Science, Chile; www.conicyt.cl) through Proyectos Fondecyt 1090650 and 1121043 granted to EJ. Support for JED was provided by The Santa Barbara Coastal LTER funded by the National Science Foundation (award no. OCE-0620276). IFR is a postdoctoral fellow from the Portuguese Foundation for Science and Technology–FCT (SFRH/BPD/87042/2012). The funders had no role in study design, data collection and analysis, decision to publish, or preparation of the manuscript. Data Availability All relevant data are within the paper and its Supporting Information files.